Something is blocking Windows Updates on Robert Douglas' PC. It happens every month: Windows tells you that you need to shut down the PC for an update. But sometimes, you shut it down, reboot, and you still get the update Shut down notice. The update hasn't updated. Unless your PC is entirely disconnected from the Internet, you don't want to go too long without letting Windows update itself. This isn't just a matter of gaining new features or even fixing some annoying bugs. This is about plugging security holes through which a cyber criminal can gain control of your machine. So what can you do when Windows Update fails to install an update? I can't guarantee that I can fix your problem, but one of these solutions might do the trick. First, use System Restore. To open that program in Windows 7, click Start, type system restore, and select System Restore. In Windows 8, go to the Search charm, type restore point, and select Create a restore point. Then, in the resulting dialog box, click the System Restore button. In the resulting System Restore wizard, select a restore point dated before the first failed update (you may need to check Show more restore points). When you're done with the wizard, Windows will reboot. After that, launch Windows Update and try again. Check for malware. A Trojan or other malicious program could be intentionally blocking the update, and it may have already compromised your antivirus program. See When malware strikes: How to clean an infected PC for advice. Try Microsoft's diagnostic tool. It's called the Windows Update Troubleshooter. It's free, and it might find the problem. Reset Windows Update. This is a complicated task, best described in this Microsoft Support article. After I'd written the first draft of this article and sent it to Mr. Douglas, my own PC failed to install an update. 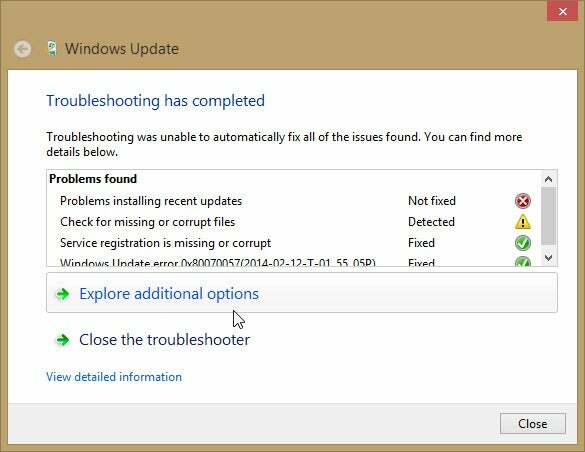 System Restore, scanning for malware, and the Update Troubleshooter all failed to fix the problem. Then, just before resetting Windows Update, I tried rebooting one more time. The update installed flawlessly. All sorts of mysterious and often temporary problems can keep an update from installing. Perhaps even, as Mr. Douglas theorized in a follow-up email, "my diet lacks oat meal porridge."